If you’re like me, you have a thirst for knowledge. With that thirst, you try to read and learn as much as you can… but sometimes things just don’t stick, right? So what is it that makes some pieces of information stick and some that seem to fall through the cracks like what’s his name you just met? Much of this is science backed and is proven to work… I will not recite any scientific studies but if you would like to read more into them, be my guest. All tips below work (for me) and I know at least some of them will work for you. It is true that relevance to your own life evokes emotion. New knowledge sticks best when it is attached to something familiar. When you are in school or you are reading a new book, being able to relate to the information in one way or another will help it stick much faster. Not only will it stick but you will be able to actually apply the information. Finding ways to make information relevant to your own life sometimes takes some trial and error, some imagination, and being able to think openly and non judgemental. For example if you have to relate this new book on marketing you picked up to baseball, don’t judge yourself for making such an “odd” connection… just run with it. When I was in college doing my classes on programming, we used a language called PHP. The way my professor taught changed my life forever and helped me realize how to turn almost anything into something relatable. It then hit me that I could make a virtual library that would account for all of the books I owned. This was a great way for me to really apply a design to the program and actually make something useful. Being able to define what you want to learn will help your ability to read faster as well as your ability to retain information. If you are trying to learn how to file business taxes and you are reading a book that includes other financial subjects you are already familiar with, you are able to focus on what your learning goal is. This saves time and energy. If you pick out exactly what you want to learn from this book or article, you have a better chance of learning than if you were to just read the book from cover to cover. It’s much easier getting one chunk of specific information to stick than it is to read a bunch of information and then picking one specific part to stick. The next step in the process is answering “why did you pick this book?” This isn’t as important as knowing what you want to learn, but this help in being able to pick out exactly what you will be reading in the book. Skimming the book and finding online summaries will help you figure out how the book is structured. Once you see how the book is structured, you’ll be able to pick which areas to read and which to skip. Maybe you read an online summary of a book that you thought would help you learn a specific subject but you realize the book only touches on the subject in a general fashion. This will help save time and keep you from reading a whole book without learning what you set out to learn. Note: I enjoy reading for the purpose of learning anything but if you are trying to make a particular piece of information stick; it’s not smart to read the whole book unless it is all written about your subject of choice. While you see if the book is a good fit, finding out how the book is structured will help you identify the key points. Write down the key points that you identify and leave plenty of room for notes as you read. When you write notes as you read, you are basically summarizing the book into your own words. This will help you recall and apply what you are learning. It’s in our DNA to want to learn something we are curious about. If you are reading about a subject you really don’t have any curiosity or care for, it will be hard to get it to stick. Like I mentioned above, keep notes of main takeaways from the reading. If you do this, you’ll have a relevant summary of the book in your own words and it’ll be laid out the way your brain understands things. Keeping notes for subjects that you will need to recall upon is also a great strategy to save time. For my MECP certification, I knew there would be certain numbers and measurements I would be better off writing down than trying to get to stick. Note taking is a skill in itself and I think is becoming a lost art with the information of the world at our fingertips. This also makes it harder to want to remember things since we can just look it up anytime, anywhere. Repetition is the key to learning (most of the time). Review the summary you’ve taken notes on and try to fill in other details that you remember as you go. Being able to put what you learned into words you understand and in a fashion that your brain works will help you retain the information for life. Don’t be afraid to review your notes multiple times after you’ve read the book! Being able to teach someone else the subject you just learned is a fail-safe way to see if you have learned what you set out to learn. As I’ve progressed through life I’ve come to realize that it’s the hard truth. If you stumble over words and have a hard time explaining something in the most simple terms… you just don’t understand it well enough. If you can generate curiosity for a subject, make it relate to you in some way, and take notes on the subject as you read, you are going to have a much better chance of retaining the information. Take some of the speed reading advice I give and run with it. Save your brain power by skimming books and figuring out exactly what you need to read to learn what you want to learn. I challenge you to learn something that is out of your comfort zone. I want you to follow these tips and let me know in the comments how it is going. If you come up with your own way to retain information better, feel free to leave a comment and let me know. I love sharing ideas. 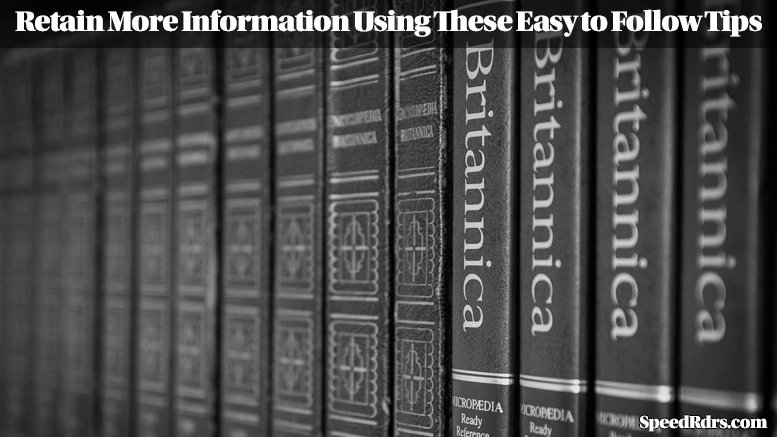 Be the first to comment on "Retain More Information Using These Easy To Follow Tips"